When it comes to fitness I was no where near on point for June, a lot of excuses can be made but really all I can do is just do better for July! I mean the only one who is hurting from this is myself! 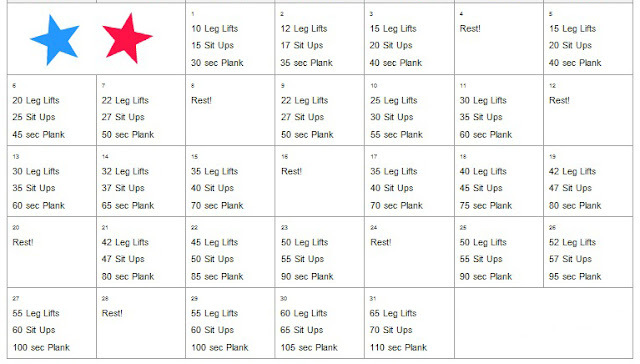 Previously I mentioned wanting to do an squat challenge for July however I came across this ab challenge that incorporated a few different exercises that builds up to a completely manageable goal number that I decided to go with this one first. Plus it is a 31 day challenge so the days lined up nicely with July! 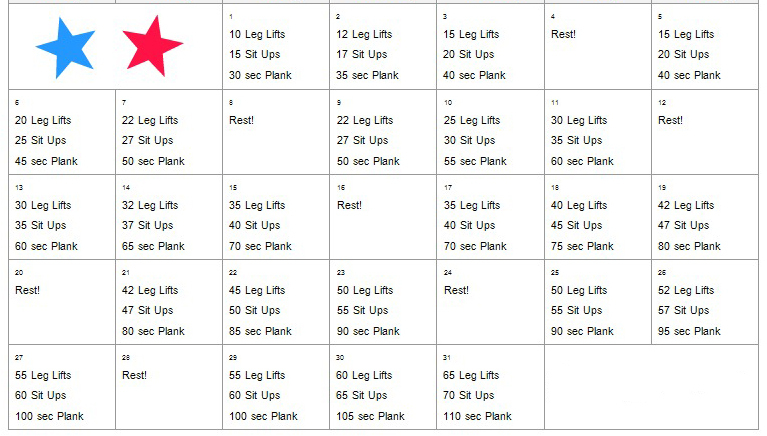 This challenge combines leg lifts, sit ups, and planks with rest days every three days, and this time I feel like I can actually accomplish the planks because the last day of 110 seconds which is something I can totally do especially with the build up leading to it. As for the food front of things, I've been working on eating a bigger breakfast that is more balanced. I used to be heavy on the fresh fruit and protein while eating very little carbs so I'm trying to incorporate some carbs in my breakfast to kind of balance everything out. I could definitely use some help with drinking more water throughout the day, that is getting pushed to the side, but I'm pleased that with the big breakfast it cuts my lunch a lot smaller and minimizes my need to snack. It's still very hit or miss when it comes to reaching my 5000 steps a day, I can absolutely kill it for a week and then have 2-3 days the next week where I'm struggling to reach even 2000 steps. I need to start setting alarms on my phone to remind myself to get up and walk while I'm at work. Actually what would help the most is to drink more water so the natural urge to go to the bathroom would certainly help!